While it is a very rare occurrence, usually less than ten per year, every now and then someone loses their life after they were stung multiple times by bees or similarly venomous insects. However, while most people can admit to receiving bee stings in the past, few end up in the hospital afterward, but this can be the case for anyone with a bee allergy. If people are lucky, any allergies they have are discovered when they’re still young, but what about those who don’t? How can they determine whether they’ll have a serious reaction to bee stings? Honeybees work collectively with each other as a hive, protecting the queen bee, who produces more bees, which fly out to gather pollen or nectar and bring it back to make honey. Now, honeybees have evolved barbed stingers at one end of their abdomens and venom sacs. The stinger is what they use if under attack, with the barb piercing the skin, injecting venom, and releasing a pheromone inciting other honeybees to join in on the attack. The injected venom, a complex mix of organic molecules and proteins, causes local swelling, pain, irritation, and itching, all of which could last hours. Single bee stings are usually limited to local effects, but some people can develop allergies to the proteins within venom. 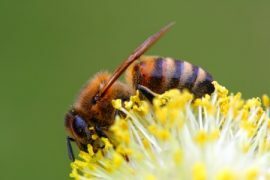 Anaphylaxis, a potentially life-threatening allergic reaction, is the most severe reaction the immune system can have in order to protect the body against bee venom. This allergy, not the bee venom itself, is typically what causes life-threatening problems and hospitalization. If you’ve never been stung before, you’re likely not allergic to bee venom, but, for those who have been, the potential development of an allergy is there. If you’ve experienced large localized reactions from bee stings or symptoms distinct from the bee sting site (swelling and rashes elsewhere, difficulty breathing, dizziness), you might have developed an allergy. Blood allergy or skin testing by allergy specialists could help exclude or confirm possible allergy triggers and assess one’s risk of severe anaphylaxis. There is an effective method for treating severe honeybee allergies called immunotherapy, which involves regularly administrating doses of venom extract that gradually increase over a three to five year period. This treatment is meant for desensitizing the immune system and basically “switching off” the body’s allergic reaction to bee venom. For honeybees specifically, they leave their stingers within a person’s skin and die soon afterward. Removing the stinger within 30 seconds can limit how much venom is injected, which can be done using a hard surface, such as a car key, a credit card edge, or a fingernail, to scratch or flick the barb out. For minor reactions like local swelling and pain, an ice pack could help relieve symptoms. If you receive a sting around the neck and experience wheezing, difficulty breathing, or dizziness, you should seek medical attention immediately.